Summer is by far my favorite season. There is nothing I love more than relaxing on the beach – I love to put my beach chair right where the surf hits the sand. It’s hot out, but with the water coming up and hitting my feet … there’s just no better feeling. Naturally, I had to create a manicure dedicated to it! I’ve seen a few palm tree manicures floating around Pinterest, so I had to try one myself. The colors, the vibe, everything connects me to the summer season. Learn how to get this look yourself below! The more I practice an ombre manicure, the better I get at it. I’m not trying to brag – practice makes perfect! My first attempt at ombre was pretty much a fail. I’ve made mistakes and learned how to adapt – so I’m actually obsessed with my current ombre! After my basic nail prep and base coat, I started my manicure with two coats of Mary Kay’s Limited-Edition Nail Lacquer in Lemon Parfait. To be totally honest, I’m obsessed with this polish – both the color and the coverage. It’s such a smooth, creamy pastel yellow. I never thought that yellow polish would look good with my skin tone, but this one really does. Before moving on to the next step, you’ll want to let your base color to dry completely. Sponging on top of wet polish will just ruin what you’ve already laid down. Once your nails are completely dry, take your sponge – I use regular triangular cosmetic sponges – and apply a line of each color you’ll be using, barely overlapping. I used Mary Kay’s Lemon Parfait (yellow), Color Club’s Reign in Spain (coral-y orange), and OPI’s Lunch at the Delhi (coral-y red). You can really use any colors you’d like with this technique, but for a summer sunset manicure, I think reds and yellows or purples and blues would work best. Take your sponge and lightly dab it onto your nail several times, moving the sponge slightly each time so that the layers blend. This is key! I used to think I had to keep my sponge in the exact same place with each dab – but that doesn’t even make sense. So make sure you’re “blending.” Repeat the process on each nail. Don’t worry if the polish is a little bumpy – your top coat will fix that! And definitely don’t worry if you get polish all over your cuticles – there’s no way to avoid it, and it’ll be easy enough to get off with a brush and some remover later. For my top coat, I wanted to go matte, so I used NYC’s Matte Me Crazy Mattifying Top Coat. I applied my top coat before the palm tree design because I created the design with a Sharpie, so I actually let my ombre manicure dry overnight before moving on to the design. Anyway, wait a while before applying your top coat so you don’t smudge the Sharpie. But once it’s dry, you can finish your look with another swipe of top coat! 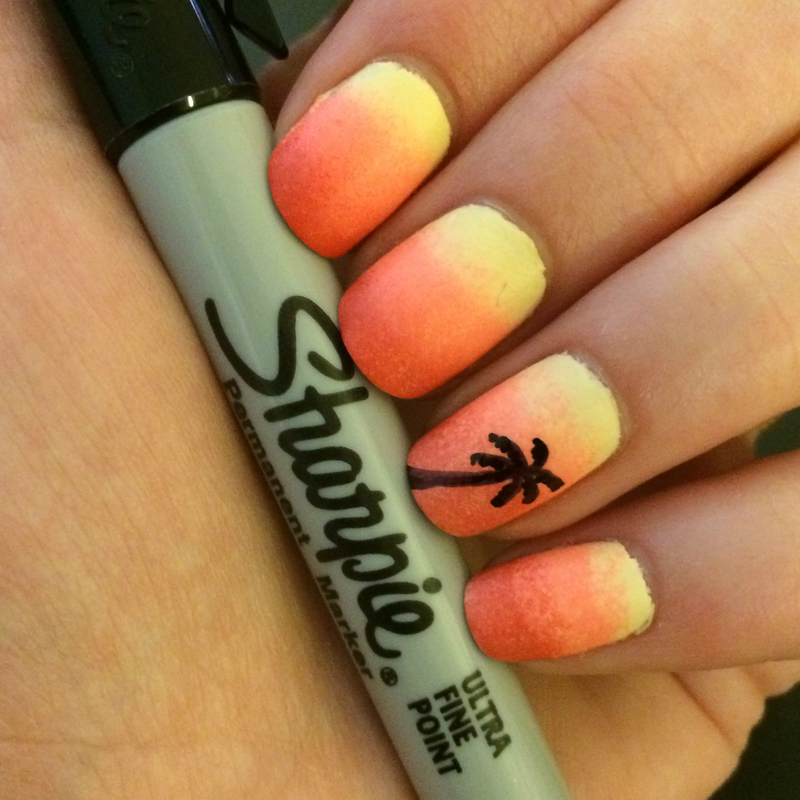 You have captured the Hawaiian moment here on your nails. Great post!